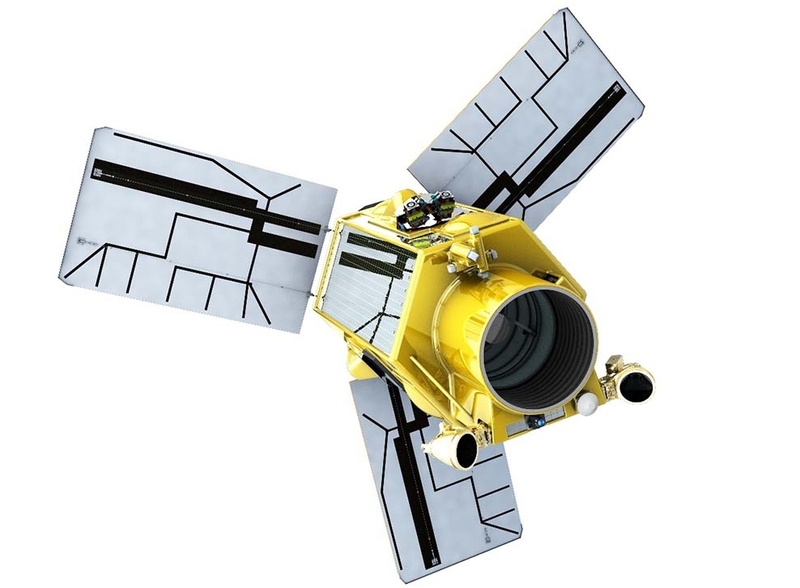 EgyptSat-A is a high-resolution Earth observation satellite developed by Russian corporation RKK Energia on behalf of Egypt’s National Authority for Remote Sensing and Space Sciences (NARSS). The satellite carries a multispectral imaging payload based on that flown aboard a previous satellite, EgyptSat-2, which could take pictures of the surface at resolutions of up to 4 metres (13 feet), or 1 metre (3 feet) when operating in panchromatic mode – combining all wavelengths of light into a single monochrome image. RKK Energia’s 559GK bus serves as the basis for the EgyptSat-A satellite, which has a hexagonal prism shape with three deployable solar panels and SPD-70 xenon-ion thrusters for on-orbit maneuvering. The satellite’s mass is likely around 1,000 kilograms (2,200 lb) – similar to its predecessor EgyptSat-2. EgyptSat-A is an evolution of the EgyptSat-2 spacecraft which launched in April 2014. Also built around Energia’s 559GK platform, EgyptSat-2 was expected to operate for eleven years but was declared a total loss after the failure of both its primary and secondary onboard computers a few seconds apart on 12 April 2015 – four days before the first anniversary of its launch. The earlier EgyptSat-1 satellite also ceased operations short of its planned lifespan, suffering a communications malfunction three years and three months into its five-year mission. Compared to EgyptSat-2, EgyptSat-A incorporates modernized electrical and flight control systems, an improved imaging payload, a higher-throughput communications system and more efficient solar arrays. EgyptSat-A will also benefit from a more powerful carrier rocket, allowing it to be placed into a sun-synchronous orbit more suited to Earth imaging than the lower-inclination orbit in which EgyptSat-2 operated. The sun-synchronous orbit is a type of near-polar low Earth orbit that allows a satellite to pass over each point on the Earth’s surface at the same mean solar time for consistent lighting conditions. 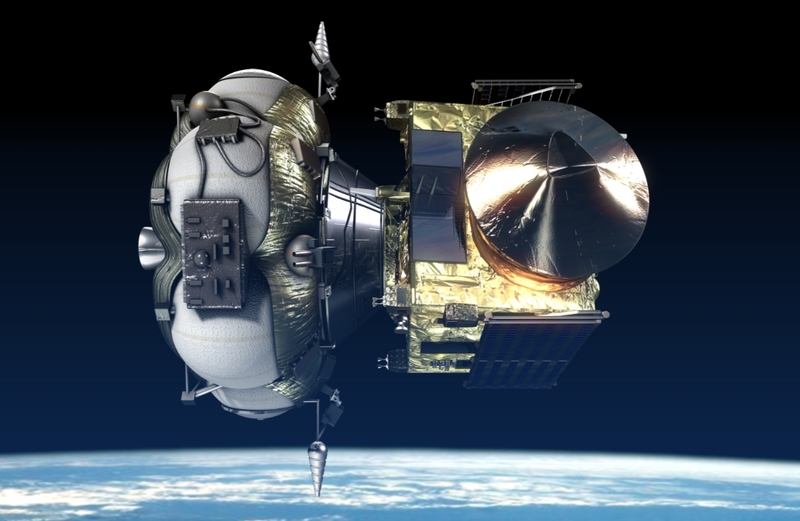 A Soyuz-2-1b rocket was used to launch EgyptSat-A, with a Fregat-M upper stage performing the satellite’s final insertion into sun-synchronous orbit, in contrast to the Soyuz-U rocket without an upper stage that was used to launch EgyptSat-2. Soyuz flew from Launcher 6 at Site 31 of the Baikonur Cosmodrome in Kazakhstan. Site 31/6 is one of two operational Soyuz pads at Baikonur – alongside the more well-known Site 1/5. Both pads were originally constructed for trials of Sergei Korolev’s R-7 missile in the 1950s, with Site 31 supporting its first launch in 1961. While the R-7 was short-lived as a missile, it spawned a series of carrier rockets that served as the backbone of the Soviet and later Russian space programme – both military and civilian. These began with the use of a modified R-7 to deploy the world’s first satellite, Sputnik, in October 1957 and continued with rockets such as the Vostok and Voskhod that used upper stages to place heavier payloads into orbit, and the Molniya which used two additional stages to reach higher orbits. Soyuz first flew in 1966 as an upgraded Voskhod to support the new crewed Soyuz spacecraft, and initially all of its flights were in support of the Soviet human spaceflight program. This changed in the 1970s, first with the introduction of the Soyuz-L with a reinforced third stage that allowed it to carry prototypes of the LK lunar lander for testing in low Earth orbit, followed by the Soyuz-M which deployed military satellites that had become too heavy to fly on Voskhod. The universal Soyuz-U rocket was introduced in 1973 to replace many of the different R-7 rockets then in use and remained in service until 2017. The Soyuz-2 rockets are modernized vehicles based on the Soyuz-U and its predecessors, bringing the series into the twenty-first century. Soyuz-2 introduced digital flight controls and upgraded engines, while the Soyuz-2-1b also incorporates a more powerful third stage propulsion system, with and RD-0124 engine in place of the RD-0110 series used on earlier versions of Soyuz and also the Soyuz-2-1a. A third version, Soyuz-2-1v, is optimized for launching smaller satellites by removing the four boosters that serve as the first stage of other Soyuz rockets, and using an NK-33 engine to power its first stage (the Soyuz-2-1b’s second stage) instead of an RD-108A. As well as the two launch pads at Baikonur, Soyuz has launch facilities at the Plesetsk Cosmodrome in Northern Russia, the Vostochny Cosmodrome in Eastern Russia and the Centre Spatial Guyanais in Kourou, French Guiana. Plesetsk’s four launch pads were originally built for operational deployment of R-7 missiles but have since been used mostly for military orbital launches – one pad remains active in 2019, with a second expected to return to service later this year. The launch pads at Kourou and Vostochny have been built in recent years for Soyuz-2 operations, the former for commercial launch opportunities and the latter to give Russia a civilian launch site on Russian soil. The Soyuz-2-1b is a three-stage rocket although for Thursday’s launch it flew in a four-stage configuration with the Fregat-M upper stage. The numbering of these stages follows the Russian convention, with the four strap-on boosters considered the first stage even though they burn in parallel with the core – or second – stage. Fregat-M and EgyptSat-A are enclosed within a payload fairing at the nose of the rocket. The first and second stages of Soyuz are powered respectively by four RD-107A engines and a single RD-108A, which burn RG-1 kerosene propellant oxidized by liquid oxygen. The stages ignite together about sixteen seconds before liftoff, ramping up thrust before the rocket is released to begin its ascent to orbit. After launch, the stages continue to fire together for another 118 seconds before the first stage is due to separate. The four boosters separate outwards from the rest of the vehicle, venting residual oxygen to push their noses outwards, ensuring that they do not collide with the second stage which will still be firing to take EgyptSat into orbit. This separation produces a striking visual effect, known as the Korolev Cross after the chief designer of the R-7 series of rockets, Sergei Korolev. After first stage separation, the second stage of Soyuz fired for another 170 seconds. The third stage, or Blok-I, ignites its RD-0124 engine while the second stage is still thrusting to ensure its propellant remains settled. This “fire in the hole” separation event marks the beginning of a third-stage burn that will last around four and half minutes. Fregat is released shortly afterwards, firing its S5.98M engine to inject EgyptSat-A into an initial transfer orbit. Fregat will likely make a second burn following a coast phase – typically around 45 minutes after the first burn – circularise the orbit. After this burn EgyptSat-A separated, and Fregat will make an additional deorbit burn to dispose of itself into the atmosphere. It was during the Fregat burn that Russian media reported it was tracking in a lower orbit than planned, although various reports point to the issue occurring during either the third stage flight or during the first Fregat burn. Amazingly, Roscosmos then noted the mission was a success, potentially achieved by Fregat burning longer to catch up with the shortfall. Thursday’s launch was the first for Russia since late December, when a Soyuz-2-1a flew from the Vostochny Cosmodrome to deploy a pair of Kanopus-V remote sensing satellites. Russian rockets made twenty orbital launches in 2018, including three Soyuz launches from French Guiana contracted by France’s Arianespace and thirteen more Soyuz launches from Baikonur, Plesetsk and Vostochny. Another Soyuz launch was slated to take place on Tuesday; this will be a commercial mission from Kourou with six satellites for Jersey-based communications operator OneWeb. However, due to the issues with the Soyuz 2-1b launch, this has been postponed. Then, in mid-March, a Soyuz-FG rocket is due to lift off from Baikonur with Soyuz MS-12 and three Expedition 59 crewmembers bound for the International Space Station.